I realize that spring is approaching fast and maybe I should have thought to post this at the beginning of winter. But, I didn't. Maybe where you live there are still a few weeks of cold (or rainy) weather left. And, maybe the people who live in your house are just starting to...maybe...just a little bit...kind-of... get on each other's nerves? Maybe you need something to occupy your time and are sick of watching loved ones veg out in front of all manner of screens. First off, is a classic card game. 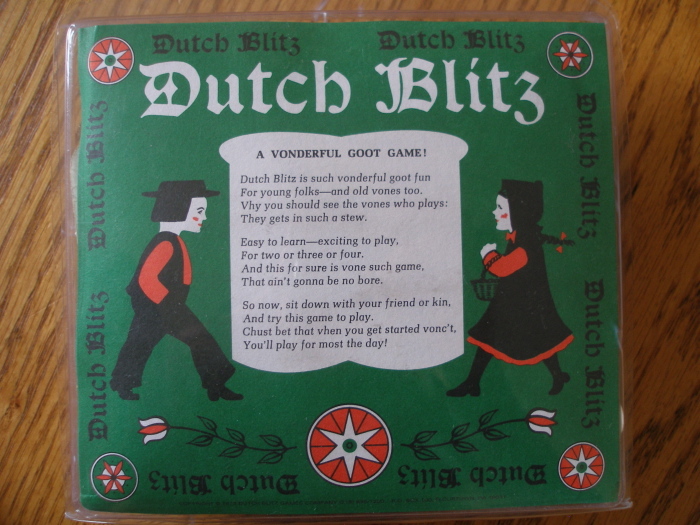 If you haven't played Dutch Blitz , you're in for a fun time. Kids can join in because all you need to know is how to count to 12, how to match colors and how to move fast! 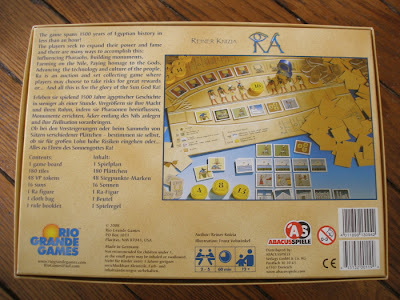 I got this game for Christmas this past year. Buzz Word is another one of these clue-guessing-words-or-phrases games and it's fun as well. Older kids who can read and think fast can join in, too. See how much fun those people are having? One of our all time favorites is The Settlers of Catan (not pictured here). Carcassonne is a similar kind of game in that you're building a community-of-sorts by constructing cities, roads and even cloisters, racking up points along the way. 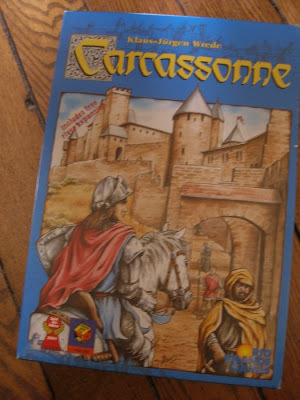 A perfect game if you're studying the Middle Ages (which we are). Sam enjoys playing both of these games with us (he's 8). This next game is a bit different. I really don't know how to describe it- you just have to play it. 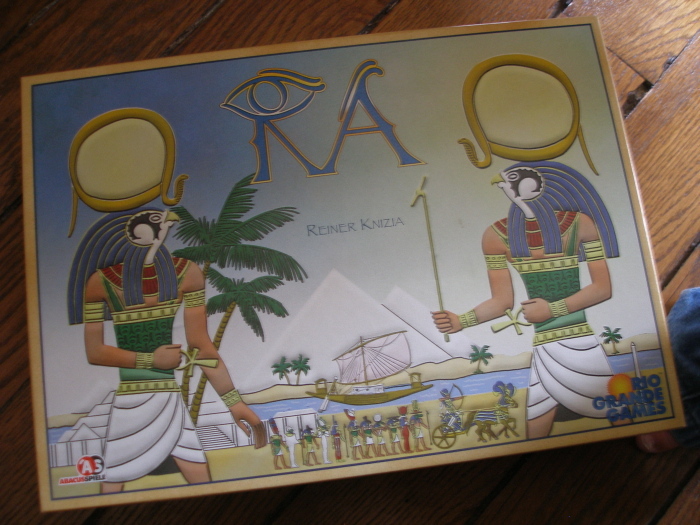 And, yes, RA , is the sun god. It was an opportunity to teach Sam a little Egyptian history and to talk about the importance of worshiping the Creator versus the created. He plays this one with us, too. 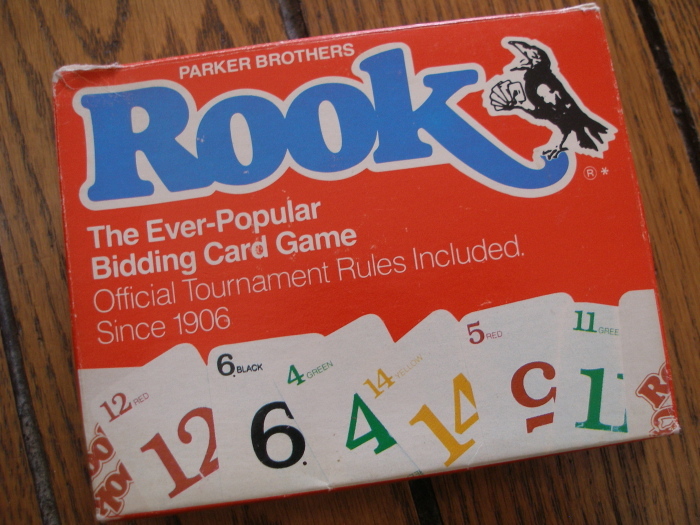 Along with Dutch Blitz, Rook is a classic Mennonite card game (although I'm sure many non-Mennonites play it as well). 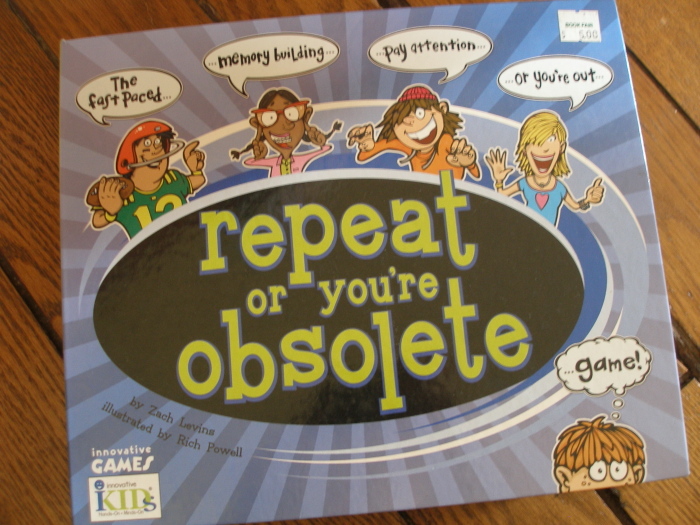 I remember my dad teaching us this game when we were kids. 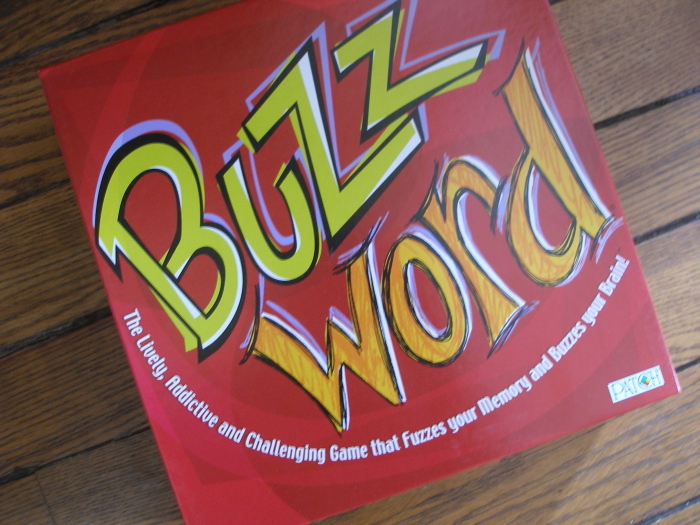 It's a game of bidding and taking hands and can be played with teams or each player scoring on their own. Another really fun game. Now we'll move on to some kid's games. As you can tell from the picture, Miriam saw me take out I Never Forget a Face and was in the process of grabbing it away from me as I quickly snapped a (lousy) picture. Miriam can't play this matching game, but she loves the children's faces and talks to them. It's really cute and I love it that my kids are getting familiar with the appearances of children from other countries. 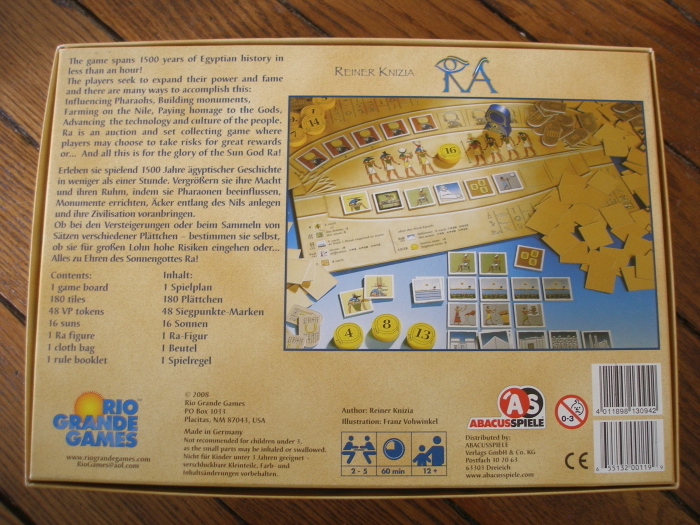 On the back of the box, it shows each face labeled with that child's country. This was a lucky find at a discount bookstore. Repeat or You're Obsolete is a memory game where you're asked a question or told to make a sound and each person has to follow suit remembering the answer of all those before them before adding their own. It's humbling, really, but an excellent brain exercise and the kids think it's hilarious. Sam was given Creationary for Christmas. 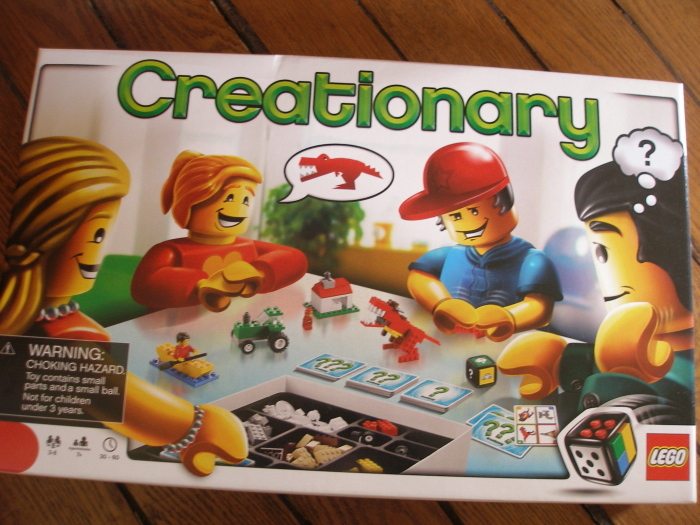 Imagine Pictionary colliding with Legos. That's what it is. Instead of drawing what you want your team to guess, you build it with the legos that are included. Little boys love it. And, finally, being a homeschooling mom, I had to throw in an obviously educational game. 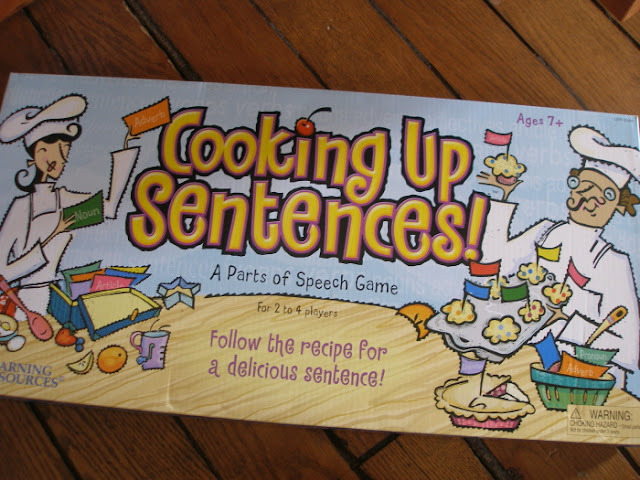 Cooking Up Sentences helps you to learn your parts of speech as you follow a "recipe". Let's just say it's a great way for adults to learn their parts of speech as well. So, there you have it. 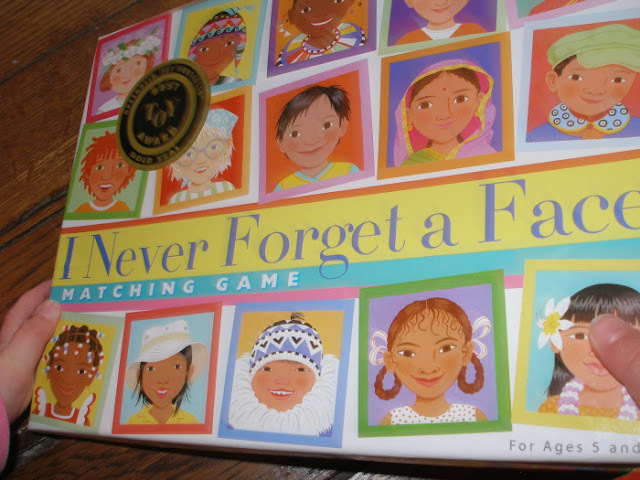 What are some of your family's favorite games? So glad you shared your game list..we also love Dutch Blitz! Rook is one I have but haven't tried to figure out. We got the family Dutch Blitz for Christmas and they all enjoy it. Oh wow! I LOVE Dutch Blitz and Rook! I grew up playing both. 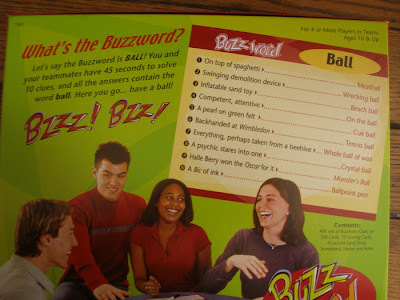 But, I gotta say that Dutch Blitz is my ALL-time favorite. We taught it to my husband's brother's girlfriend and she was squealing with delight. Settlers of Catan ranks way up there, and a new addition to our collection that I am loving is Ticket to Ride. My 10 year old loves both of them. We love Monopoly Junior! Its a great lesson on how important it is to put your money to work. And my daughter loves it when her 3 brothers have to pay her for landing on one of her properties! By the way, we are long time readers and first time commenters. Love your blog! For another homeschooling game--my kids are loving the "Professor Noggin" games. They are simple to learn and almost all ages can play. It is a good way to learn about all sorts of subjects in really fun ways. My Grandma taught us all how to play rook, so she could wallop us! In later years, she pretended to not know how to play to sucker us into playing with her. I can't really remember exactly how to play, besides being able to trade in your hand for the one in the pot, or something like that. We like Spot It (ages 4 & up), Lost Cities (ages 10 & up) & Set (ages 7 & up). 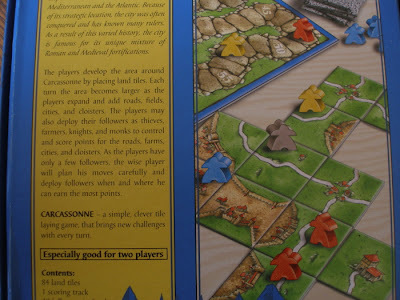 Settlers of Cattan is one we would like to own...thank you for putting that thought into my head once again. I've been wanting to play more games with the children. My husband is not much for games (how did I marry him!? my family of origin is crazy on games). And Mancala (an African marble game) has surfaced recently - not sure if I can teach that to my 5 year old, but I'm going to try. My very favorite game is Canasta, a card game that's part skill, part luck. I also adore word games, especially Scattergories and quick Scrabble.